The U.S. government is establishing a "virtual proving ground" to help the military develop new techniques and train its soldiers in the art of "cyber warfare." John Hopkins University and Northrop Grumman have been awarded contracts to help develop the National Cyber Range in conjunction with the Defense Advanced Research Projects Agency, better known as DARPA. While the military has engaged in cyber warfare training and war games in the past, the NCR represents a "formalization" of those efforts where soldiers can hone their computer warfare skills. "DARPA is in the business of security. They have built what they think are good cyber defenses, and [the NCR] will let them put it into production," said Ed Adams of Security Innovation, which has previously done cyber security work with the Department of Defense. "Think of it like the board game Risk. Instead of having little squares sitting on top of Brazil, you have virtual avatars sitting on a piece of data that you are assigned to protect." "Low level processor unit attacks are like attacking an individual foot soldier," he continued. "A denial of service attack would be more like a mortar shelling or blitzkrieg." NCR personnel will develop and test a range of new virtual weapons and defenses against them and will also be able to test them in environments outside real-time, an important tool to effectively training cyber soldiers, said DARPA spokeswoman Jan Walker. "Sometimes you need to see how a computer program works faster than in real time," she said. "Other times you want to slow down time because computers often take actions so quickly you can't see what happened in real time." Established in 1958 in response to the Soviet launch of Sputnik, DARPA's ongoing mission is to provide the U.S. Department of Defense with a technological edge over the militaries of other nations. Unlike most defense contractors which focus on specific projects or technology, DARPA focuses on long-range projects described as "high risk, high payoff" research. But despite their sometimes dubious apparent value, many DARPA projects have evolved into groundbreaking new technologies, perhaps most famously the ARPANET, predecessor to the internet. 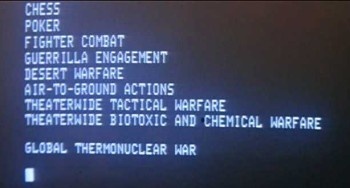 It's an interesting story but that picture from "War Games" gives it a creepy feeling to it. Man, I'm such a nerd. I kept reading NCR as the New California Republic instead of the technology company. Older nerds would likely read it as the technology company - it was one of the "Seven Dwarfs" of mainframe design circa 1960 and managed to last to become part of the "BUNCH". Nothing could really take on IBM in those days, though.